The perfect makeup kit should contain everything you need to make your skin look flawless. 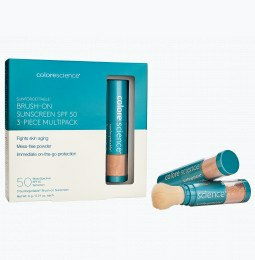 If you want perfect skin come rain or shine, Colorescience offers unique makeup kits designed to suit your skin type and lifestyle. Our kits come complete with an easy skin care regimen perfect for you. What makeup should I wear? There are thousands of makeup kits on the market promising healthier and more youthful skin, but not all can deliver that promise. Finding the makeup powder collection that matches your individual skin type can feel like a chore. If you want a makeup that covers acne, reduces visible wrinkles, and leaves skin looking smooth and refreshed, look no further than Colorescience. At Colorescience, we believe that achieving perfect skin should be simple. Our mineral powder sets contain products that help you take your makeup routine to the next level and optimize your look for a flawless finish. Whether you want to correct imperfections, treat sensitive skin, need makeup to match your active lifestyle, or want a matte look, there’s a makeup kit waiting to help achieve the look you desire. Should I consider my skin type when choosing a makeup kit? Our everyday cosmetics products are made for a variety of skin types and lifestyles. We have sets for oily skin, dry skin, and combination skin. Youthful skin products and makeup for acne prone skin can be difficult to find, but our makeup kits are designed to help you manage or minimize acne and acne marks. Try one of our five different kits today to correct imperfections and protect sensitive skin. 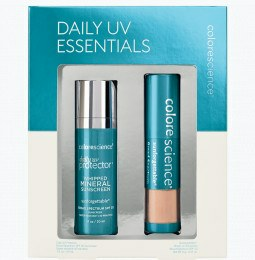 At Colorescience, we take to heart our client’s skincare needs, so we provide essential mineral makeup kits that include mineral makeup SPF 50 sunscreens that work to keep aging skin at bay. No matter your lifestyle or skin type, we have everyday mineral makeup that will make your face look firm, youthful, and polished to perfection. We are so sure of our products that we offer complimentary shipping and returns. If you’re not happy with our product, you can return it no questions asked. What do you have to lose? Choose your perfect makeup kit today.